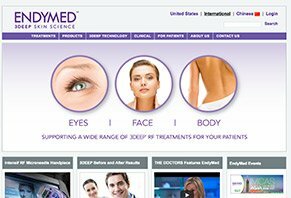 EndyMed Reviews - Is it a Scam or Legit? EndyMed’s radio frequency treatment systems, combined with their 3DEEP technology, promise to reduce the appearance of wrinkles and other signs of aging. Searching for a new way to possibly reduce wrinkles, boost collagen production, and address other signs of aging? Established in 2007, EndyMed Medical develops “energy based aesthetic treatment systems” that promise to painlessly deliver targeted heat to different areas of the body, including the face. We’re told that this unique approach, along with tissue sensors and feedback mechanisms, allows EndyMed’s FDA cleared devices to provide personalized treatments for each patient. At the heart of many of EndyMed’s devices is their proprietary 3DEEP radio frequency (RF) technology, which they claim will tighten skin, reduce the appearance of wrinkles and cellulite, and stimulate natural collagen production. In combination with their different handpieces (more about this shortly), this 3DEEP technology can also provide body contouring and tightening, as well as fractional skin resurfacing and scar treatments. EndyMed tells us their 3DEEP technology provides “superior efficacy,” with little-to-no discomfort or downtime; immediate improvement, long-lasting results, and quick procedure times. There’s no doubt that nearly all of us want smoother skin, fewer wrinkles, and firmer body contours. After all, that’s why you’re here, right? But can EndyMed’s devices really help you get there? Are they inexpensive? Are they really painless? By the end of this review, you should have all the key information you need to make a more informed decision. To get the ball rolling, let’s take a look at how EndyMed’s products work. What Is EndyMed’s 3DEEP Technology? We’ll talk more about the company’s individual devices and handsets in a second. First though, let’s talk about the 3DEEP technology at the root of each one. In a nutshell, 3DEEP uses something called radio frequency (RF) to deliver gentle heat to the epidermis (the outermost layer of skin), which in turn heats the collagen (the most prevalent protein that acts as an underlying support structure for skin). This heat causes the collagen to contract and provides an immediate lift, while new collagen production is triggered to result in an even more significant long-term change in your appearance. Already, so this is the proprietary technology featured in EndyMed’s devices. Now, let’s talk about the devices themselves. What’s the Difference Between Each EndyMed Device? EndyMed’s PRO is the flagship device in their lineup, and is promoted as a “multi-application treatment platform” that features an intuitive touch screen interface; real time, customizable impedance measures (for measuring and directing the RF energy); different treatment presets, and is equipped with a range of safety features. EndyMed PRO is compatible with all handpieces (again, we’ll talk more about these shortly) and can be customized for different applications and treatment areas. Smaller and more compact than the PRO, EndyMed’s Pure line is claimed to deliver professional grade fractional skin resurfacing (also known as laser resurfacing) for the face, neck, and body, along with body contouring and facial and upper body tightening. The company claims this makes it ideal for a wide range of treatments, including sagging skin, acne scars, wrinkle reduction, and more. Pure: Fixed FSR handpiece and one exchangeable connector, which can be used with all handpieces. Pure+: Two changeable connectors on all sides, suitable for all handpieces. The Glow device is intended specifically for facial and neck skin tightening treatments, including the hands and décolletage. Each one comes equipped with two handpieces, which can “optimize energy settings” using different presets based on clinical experience. In addition, Glow features some unique safety mechanisms like skin impedance monitoring (ensuring the exact amount of energy needed reaches your skin), built-in motion sensors that only deliver energy when the handpiece is in motion, and sensors to prevent arcing unless in full contact with your skin. Now that we know more about EndyMed’s different devices, let’s move on to their handpieces that attach to them. What’s the Difference Between EndyMed’s Handpieces? EndyMed claims their iFine handpiece was designed specifically to treat delicate skin around the eyes and mouth, leading to smoother, tighter skin; reduced under eye sagging, more youthful looking eyes, and a reduction in fine lines around the mouth. Designed for less delicate areas than the iFine, the Fine handpiece is intended to addresses smaller body areas, such as the forehead. As the name implies, EndyMed’s Large handpiece is designed to treat larger body areas, such as the “abdomen, buttocks and thighs.” This can be used to treat skin laxity (i.e. sagging skin) and cellulite, as well as to shape the body and reduce circumference. Speaking of shaping, EndyMed’s Shaper handpiece claims to deliver smoother, tighter skin around the waist, abdomen, buttocks, and thighs and reduce the appearance of cellulite, while doing so in shorter treatment times (20-30 minutes). Fractional skin resurfacing (again, more commonly known as laser resurfacing) is a common anti-aging and beauty treatment that sends concentrated pulses of light at irregular skin surfaces, such as wrinkles, acne scars, and other blemishes. As it does this, it removes layers of skin to produce a more even appearance. Regarding EndyMed’s FSR handpiece, we’re told it features a matrix of 112 electrodes that can provide both dermal heating and micro-ablation (yet another term for resurfacing), making it effective for treating rough, hyper-pigmented, wrinkled, or scarred skin. It can also be used for either micro-ablation or dermal heating (it isn’t limited to both). Just like RF technology and fractional skin resurfacing (FSR) aren’t necessarily new skincare technologies, neither is micro-needling. Here, tiny needles pierce the skin and cause micro-injuries, which promotes collagen production as these injuries heal. In most instances, micro-needling is performed using something called a dermaroller, which can be applied at home or in your dermatologist’s office. Comparatively, EndyMed’s Intensif RD microneedle treatment uses tiny needles to pierce the skin too, but also uses these micro-needles to emit heat into the dermis, further triggering the production of new collagen. Based on what we’ve learned so far, it seems like EndyMed’s lineup of devices and handpieces can provide quick, easy, and painless anti-aging and skincare treatments. But does the company provide any clinical evidence to support their claims? Are EndyMed’s Devices Clinically Proven? While this is positive, we could only uncover FDA clearances for EndyMed’s Glow and Intensif devices, as well as an unknown (perhaps soon-to-be-released?) Newa device. What about clinical evidence, though? Given their claims and clinically tested devices, how much can you expect to pay for an EndyMed treatment? How Much Do EndyMed Treatments Cost? As you might imagine, the exact costs associated with your EndyMed treatments can vary based on the specific treatment you need, the number of treatments, your physician’s pricing, and much more. In general though, according to RealSelf readers (more next), you can expect to pay anywhere from $400 to $3,000 or more, with the average price coming in at $1,925. Note: Many of these higher numbers involved multiple treatments. Are EndyMed Treatments Covered by Insurance? Given their relatively high cost, you might be wondering if EndyMed’s treatments are covered by health insurance. In general, EndyMed treatments would be classified as cosmetic in nature (i.e. not medically necessary), so most health insurance companies won’t cover the costs. How Many EndyMed Treatments Are Required? Similar to cost, EndyMed claims that the number of treatments you’ll need depend on many different factors. However, if needed, your doctor will offer a series of up to 6 treatments, spaced 1-2 weeks apart. Following each treatment, you’ll be able to resume all routine activities, although you may experience slight redness around the treatment area. In most cases, this will subside after a couple hours. How Soon Can You Expect to See Benefits? How Long Will They Last? Although EndyMed claims you’ll experience immediate results with most of their treatments, they also state that your skin will gradually continue to improve over time. As far as Fractional Skin Resurfacing, you could see benefits as soon as one week after your first treatment. Again, these will continue to improve with time. Acne scars may take an additional 1 to 2 treatments before seeing clear results. Obviously, all of these answers were directly from the company. What are EndyMed’s real-world customers experiencing? What’s Everyone Saying In Their EndyMed Reviews? Coming back to the RealSelf article we linked to above, among a total of 7 reviewers, only 43% would define their procedure as “worth it.” Why? Important note: In many of these instances, it appears that the technicians who applied the treatments (and the techniques they used) were to blame, not the devices themselves. Outside of these, we didn’t encounter any first-person client reviews for EndyMed’s devices or treatments at the time of our research. We’ve covered a whole lot of territory today, so let’s wrap things up so you can decide what to do next when it comes to EndyMed. Should You Undergo an EndyMed Treatment? As we’ve mentioned a couple times now, radio frequency skin tightening treatments have been used for years, both in professional and at-home settings, so this technology isn’t necessarily anything new. But EndyMed’s 3DEEP technology—and the potentially faster, more visible, and pain-free results it’s supposed to deliver—just might be. Just like any other purchasing decision though, you might have to make some compromises with EndyMed when compared to traditional options. Namely, price. On top of this, some patients claimed their EndyMed procedure hurt fairly bad, and noted that the technician performing the procedure might be more important than the device they’re using. From this perspective, we’d recommend thoroughly researching patient reviews for any clinic you’re thinking of attending, long before you’re on the table. Did you undergo an EndyMed treatment? If so, which one? Did it provide results (short or long term)? Would you consider it a good value? Whatever you experienced, tell us about it in your very own review below! EndyMed's NEWA home device is heavily promoted on the internet, with a guaranteed refund if the buyer is not satisfied. I made a purchase, subsequently decided to return the item, and called their service number. I was assured that I would be sent a return label. Over the course of the next three weeks, even though I repeatedly called and emailed them, I did NOT receive a label. I posted a complaint on their Instagram account, and finally, the rep that maintains their Instagram account messaged me and sent me a return label. Tracking the package shows the item was received three weeks ago. No refund has been forthcoming, and their customer service reps are very nice people, but clearly just man a phone bank and able to tell you nothing. Does the NEWA device work as promised? I honestly don't know, but I will NEVER purchase from them again and would advise others not to. I have had my second EndyMed Pro 3Deep done and it is definitely tightening my jawline and jowls. You can see results within two weeks and I expect more as time goes on. It is not painless as none of the machines are, but not terrible at all and only occasionally. Our clinic needed repair service. After months of contacting them and pleading for repair service, the unit they repaired still had problems. After continued efforts to contact them to re-do the repair, we just got ignored for months. When someone finally arranged it to be looked at, a guy named Paul denied it. The guy named Paul apparently takes charge of the company and bullies his clients by neglecting and ignoring their service needs. Tries to upsell you new equipment. You can never get service or support from this unethical company. The most unprofessional people and company I have ever dealt with. There are plenty of other laser machines and companies out there. Stay away from ENDY MED. I have had several EndyMed treatments to my face and neck. I had very good results. The operator of the machine was a professional, I had no pain, and the whole experience was very satisfactory. I would highly recommend the treatment for sagging facial skin on the jowls, neck, and around the eyes. I've had several EndyMed treatments. I started with the Fractional option, which gives skin an all over evenness of skin tone. I had about 3 of when I first tried this procedure. My skin tone improved dramatically. MyClinic then got the Microneedling option which I was ready to jump in and try, I just had my 4th session with that on the weekend. These treatments have been over 2-3 years. I try and get one every 6 months for maintenance. This year I have had the resurfacing about 6 months ago and the needling this past weekend. It is good to combine the two in my opinion. Let's just say as a maintenance to keeping skin fresh and tight, I am a believer. At 40 years old, I certainly have maintained my 30 something skin. If you are looking for instant results, then you will be disappointed, because it can take three months for the results to really show. But if you start early, the thoughts of facelifts are way-way-way in the future. The customer service never returned any emails. They over-charged the product. Although every time the customer service over the phone promised me that the refund is in process, after almost two months passed, I still don't see the refund. In addition, the product is no use to me at all. I returned the product last week and sent an email asking when I will receive a refund, but still no response from the company. I wrote negative comments in their Facebook. It was deleted by the company very soon. As a consumer, you can't return the product, it is intangible. You have a procedure, which can enhance your appearance. This report makes no sense. This treatment is amazing. I had immediate visible results to my jowls area, with NO pain. The comfort level and results are solely based on the expertise of the technician and if they were well and properly trained. In my opinion, any negatives you may have read are the fault of the technician and not the treatment (if done correctly). I received an email offering a complementary treatment, so I called and booked an appointment. It felt like a nice warm (not hot) facial massage and was very relaxing. I was actually stunned when I looked into the mirror after the treatment and saw the visible lift and how much my jawline tightened. I have had Thermage and would never again undergo that pain and lack of results, much less the outrageous cost. I have also had a face and neck lift and a refresher mini lift. Needless to say, I was hooked and booked a series of three more treatments, with the results being so outstanding that I canceled my next mini lift surgery. I would highly recommend this. Write a Review for EndyMed!